154 posts categorized "Good news"
The American Library Association has just published its newest investigation into the state of the nation's public libraries, and the news is...actually rather good. You may think that odd in an era of ubiquitous alternative distractions to reading a real book--from iPads to Kindles--but it's really these new high-tech devices, along with the Internet that's keeping libraries flourishing. The one fly in the ointment is that funding cuts seem to be threatening many services. While just a few years ago public libraries were all about borrowing books to read, or finding somewhere to study alongside handy text resources, the Net has changed much of this. Now 99.3% of the U.S.'s libraries offer Net access, via a public PC or open Wi-Fi, and 64% of libraries say they're the only free access point in their communities. With that figure stepping up to 73% for rural libraries, and 70% of libraries reporting that public use of their Net facilities increased in 2010, it's easy to see that the public library is still hugely relevant in a digital era. It seems that [the library's] Internet nexus is extremely handy for people seeking jobs, via vacancy listings and other resources: 88% of libraries offer this, and 72% say their staff are helping clients fill in application forms. Meanwhile, 25% of libraries are in partnerships with government agencies and other groups to build e-government services--almost double the 13% figure from just two years ago. Though we live in a digital era that obviates many reasons to travel, it seems the library still is the social hub for data sharing. I'm attending the Congress for the New Urbanism gathering in Madison this week, hoping to bring back some ideas (and energy) for Franklin. If we had train service between Madison and Milwaukee, I could be writing blog entries during my trips back and forth to the CNU 19 gathering; as it is, I'll have to catch up in the evenings. In the meantime, here are some great regularly updated CNU news pages that will keep you on top of the events in Madison as they happen. This is exactly the kind of useful content that a community blog should offer. Bonus feature: If you have a Google Calendar account (and/or iCal on a Mac), you can subscribe to Greg's City of Franklin Calendar and have those events integrated into your own calendar and automatically updated. Clicking "View all Events" sends you to a page with a longer list of city events as well as links to agendas and meeting minutes. I think, however, the city could stand to emulate Kowalski's use of free Google services so citizens can subscribe, for instance, to meetings covering certain TOPICS and ISSUES as well as gathering of specific commissions and committees. On June 1st, I'll be at the Congress for the New Urbanism 19 in Madison, Wisconsin attending, on behalf of the city of Franklin, an in-depth “202” session that will feature a discussion of innovative sprawl retrofit solutions by Dan Slone, June Williamson, and Galina Tachieva. Their published works include Retrofitting Suburbia, the Sprawl Repair Manual, and A Legal Guide to Urban and Sustainable Development. They will present key urban design principles, prototypical techniques, in-depth case studies, and regulatory frameworks for implementation, followed by discussion of the frontiers of innovation for suburban retrofits. 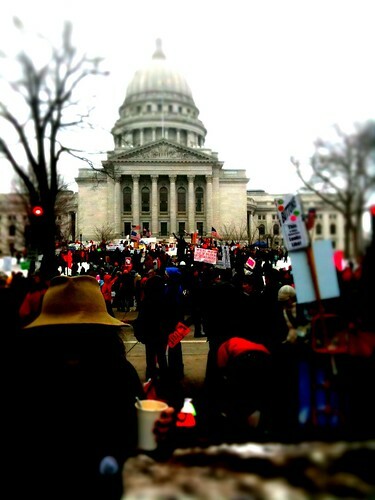 Madison Protests 3/5/11, originally uploaded by John Michlig. Awe-inspiring does not begin to describe the atmosphere on a cold day in Madison, Wisconsin. The very epitome of "the geography of nowhere" -- targeted for transformation. Next up: Trying to get Robin Williams to go 30 days without doing a Popeye impression. Equally challenging. It’s hard to conceive of a less likely poster child for the livable-communities movement, which prizes dense urban-style neighborhoods where residents can live without cars. Yet developers and county leaders in Fairfax County are close to finalizing a radical multibillion-dollar plan to “desprawl” Tysons. The proposal, aimed at attracting a total of 100,000 with the texture and energy of city life, involves tearing up large swaths of the existing town and constructing a series of urban villages, with buildings up to 25 stories high. Props are due also to an amazing bunch of urbanist and environmental Facebook and real-life friends who keep me informed on all sorts of subjects from the amusing to the profound, and thanks especially to the fabulous blog writers whose work on these subjects continually inspires me, including Steve Mouzon, Chuck Marohn, Dave Reid, Chuck Wolfe, Daniel Nairn, Aaron Renn, Jon Hiskes, Richard Layman, Sam Newberg, Justin Horner, Deron Lovaas, Mary Newsom, Jason King, Chewie, Randy Simes, Payton Chung, Warren Karlenzig, John Michlig, Karja Hansen, and some I am probably forgetting. Keep up the great work. After you read some of Kaid's entries at the link below, you'll understand why I'm so gratified to be in that list.